It is not overstating the case to say that in Herzog’s strong-willed superstars one sees either Hitler or his flip side—sometimes both. The fact that the inmates of the prison camp have dubbed one of their Pathet Lao guards “Little Hitler” will not allow us to forget the preeminent presence who lurks behind the body of Herzog’s work, nor the fact that the fiercely American pilot “Little Dieter” Dengler is German. It’s true that, over time, Herzog has begun to find his powerful personalities less among obsessed and delusional demigods and more in the ranks of ordinary folks doing their jobs, whether in Laos or Alaska or Antarctica. But it is not the ordinary or the job that interests him; it’s the challenge of the extraordinary. No wonder Dieter Dengler captured his imagination in a way that a short documentary film was helpless to exorcize. Not that it’s only the superhero who arrests Herzog’s interest. 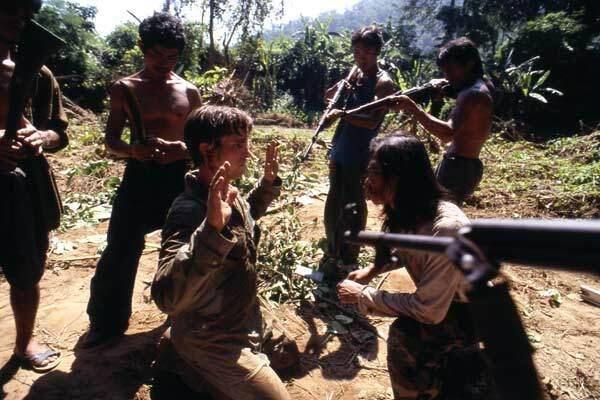 He brings to powerful life Laotian peasants, jungle guerrillas, hapless prison guards, Navy pilots, CIA de-briefers, a Pathet Lao officer—all ordinary folks doing their jobs. And Herzog doesn’t let us forget that this is not the jungle, it is their jungle, the Laotians’ jungle, into which American adventurism has intruded. The Navy pilots mock the jungle survival training film they watch aboard ship before their mission over Laos; but when Dengler is shot down mere minutes into that mission, the memory of that film stands him—and us—in good stead. 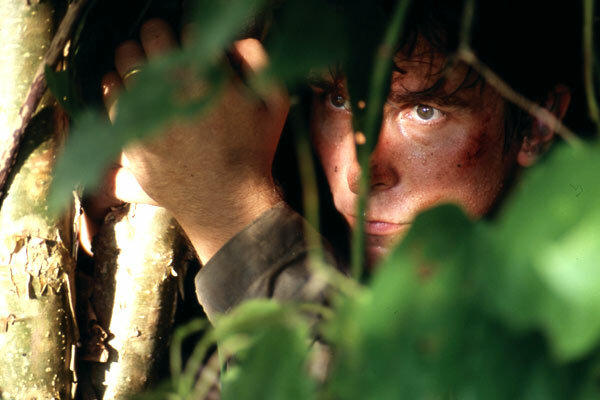 Klaus Badelt delivers a powerful and evocative score (though, as always with Badelt’s work, noticeably derivative of his mentor and colleague Hans Zimmer); but there is no music in the first sequence of the downed pilot scrambling to protect himself both from discovery by Lao troops and from the very jungle that hides him. It is all man and nature. 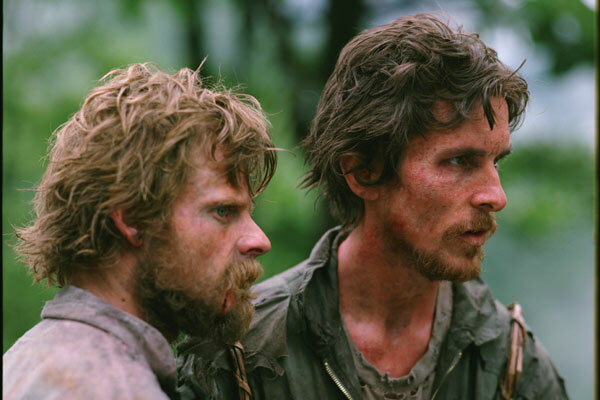 Only after the Pathet Lao raiders capture Dengler and start leading him through their jungle do Herzog and Badelt begin to amplify the film’s imagery with music. There is music at the very beginning of course, majestic music, accompanying blossoming eruptions of napalm in what has to be a deliberate evocation of Apocalypse Now, perhaps a sort of shorthand signaling Herzog’s intent to use that familiar, iconic film as his starting point. Soon enough, though, the eagle’s-eye angles on the machinery of war making illusory indentations in the indefatigable jungle (recalling Conrad’s vision of the futility of ship’s cannon “firing into a continent” in Heart of Darkness) give way to Rescue Dawn‘s defining image: the establishing overhead shot of the prison camp that confines the action of the film’s second act—a circle of red dirt surrounded by a green hell. It’s this embodiment of all that is adverse in man and nature that brings out the best in Dieter Dengler—Little Dieter who needs to fly, Dieter who loves America because she gave him wings, Dieter who’s never afraid and never gives up. Here, amid a ragtag band of Pathet Lao who are more concerned about food than about their prisoners of war, and an even sorrier band of American and Asian prisoners who have already given up, Dieter takes charge. The ending of the film has come in for a lot of criticism. In contrast to the opening sequence’s dispassionate contemplation of the fiery fruits of American war-making, the ending seems to buy into a pro-American jingoism lazily derived from Dengler’s own profession of love for America. Is Herzog serious? Or is he being ironic? Both, probably: serious about Dengler; ironic about America. Judge for yourself: Asked by an overeager p.r. officer to offer some words of wisdom to “the boys,” to inspire them to go on even when things are at their worst, Dengler thinks a moment, then intones solemnly: “Empty what is full, fill what is empty,” then explodes in giggles as he continues: “Scratch where it itches!” The p.r. officer rejoices, “They love you, man!” as this madcap German in hospital clothes is borne aloft by a wildly cheering crowd, and frozen in history with their adulation. Herzog may seem a new breed of Americanized German in Hollywood, interested in the triumph of human endurance where he was once preoccupied with the politics of power, and in the fight against madness rather than the descent into it. But the message that shines through is: whether in Laos or in Hollywood, it takes a German to show America how to do it right.